The Slovak Union of Visual Arts is a member of the International Association of Art – I.A.A. 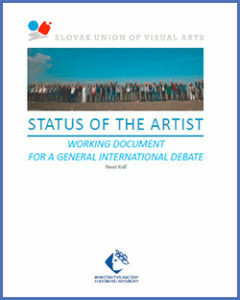 UNESCO, has a representation in Executive Commitee IAA EUROPE UNESCO, contributes in preparation and managing Conference on law and social status of European artists (in Paris, Centre Pompidou, 2008) and is a member of the Slovak Coalition for Cultural Diversity. The members representing art fields are associated on the professional, generation and regional bases. For more information about activities of Slovak Union of Visual Arts, see the current publications Ročenka SVÚ 2015/2016, Ročenka SVÚ 2014/2015 a Ročenka SVÚ 2013/2014, which you can download after clicking on pictures. Printed form is available in UMELKA Gallery.